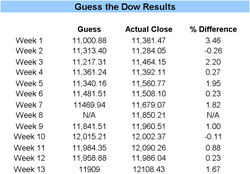 The DJIA closed today at 12,108.43 No one came within +/- 5 points with their guess, but the person who came closest ("KS") gets a free month of the Birinyi Newsletter Service nonetheless; the guess was 12,145. Below you can have a look at the historical results of our "consensus" guesses. 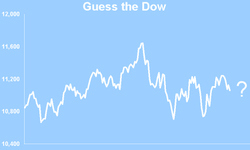 Where will the Dow close next Friday? You tell us in the comments section below!